A patient who is the first in the UK to receive the world’s most advanced 'bionic eye' has been able to read the time for the first time in more than five years.The moment Rhian Lewis, 49, realised she had correctly told the time is captured on BBC's Trust Me I’m A Doctor, to be broadcast on Wednesday night (6 January). 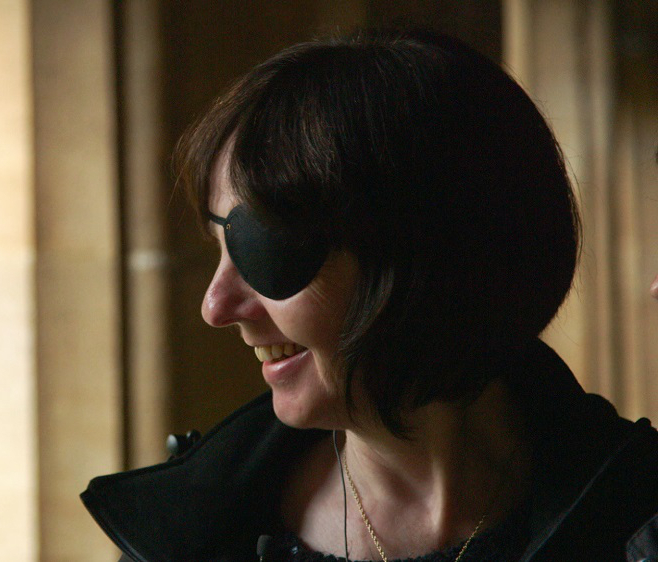 Surgeons at the Oxford Eye Hospital at Oxford's John Radcliffe Hospital implanted a tiny electronic chip at the back of Rhian's retina in her right eye as part of ongoing NHS-funded research of the technology. Now, when I locate something, especially like a spoon or a fork on the table, it's pure elation. I just get so excited that I've got something right. It's really just pure joy to get something right, because I've never done it before, well, not for the last 16 or 17 years anyway. It was funded by the National Institute for Health Research (NIHR) Invention for Innovation (i4i) programme in partnership with Retina Implant AG and the NIHR Oxford Biomedical Research Centre and the NIHR Clinical Research Network. Mother-of-two Rhian, of Cardiff, was diagnosed with retinitis pigmentosa – a disorder that destroys the light sensitive cells called photoreceptors in the retina – when she was five. She is completely blind in her right eye and has virtually no vision in her left eye as a result of the condition, for which there is no cure. But behind the destroyed photoreceptors she still had an intact optic nerve and all the brain wiring needed for vision, making it possible to restore vision if only a way could be found to substitute the function of the photoreceptors. The wafer-thin retinal implant chip – which measures 3x3mm - is inserted into the back of the eye to replace damaged photoreceptors in a delicate six to eight hour operation. The chip has been developed by German engineering firm Retina Implant AG and captures the light entering the eye to stimulate the nerve cells of the inner retina to deliver signals to the brain through the optic nerve. The device is connected to a tiny computer that sits underneath the skin behind the ear. This is powered by a magnetic coil which is applied to the skin – from the outside this looks similar to a hearing aid. The device is switched on once everything has healed up after the surgery. It takes time for users to learn to interpret the sight the implant provides as, for most of the trial patients, the parts of the brain responsible for interpreting vision have been dormant for a long time. It's an amazing process because what Rhian and others are trying to do is reactivate a part of the brain that hasn't been doing anything for the last 10 years or so and there is a lot of rehabilitation because basically they are learning to see again. When the device is first switched on they will often see flashes of light, but over a few weeks the brain converts those flashes into meaningful shapes and objects to build up an image. This image is black and white and grainy, rather like early television pictures, but for patients who have spent years without any sight at all this improvement can be life changing. One test involved Rhian looking closely at a large cardboard clock to see if she could tell the time correctly. She has not been able to tell the time with her right eye in 16 years and for about six years with her left eye. Later Rhian was taken to the cloisters of New College, Oxford to see if she could make out its features. This ground-breaking research to create the world’s most advanced bionic eye highlights the crucial role of the NHS as a test bed for 21st century medicine. In investing over £1 billion a year into the National Institute for Health Research, we are helping to translate scientific advances into real benefits for patients. She said: 'I walked up the street, and the lady from social services said to me to point out anything I thought might or might not be there. And the first thing I thought 'there might be something there,' there was a car, a silver car, and I couldn’t believe it, because the signal was really strong, and that was the sun shining on the silver car. And I was just, well, I was just so excited, I was quite teary! The impact on people with the slowly blinding condition can be devastating. Rhian said: 'The problem with having no sight is that you also lose your confidence because you lose your mobility. I don't go out and about on my own, ever. Then around the house, the kitchen, you rely on other people to find things for you – it’s very frustrating. 'It's simple things like shopping, clothes shopping, you don't know what you look like. It's been, maybe eight years that I've had any sort of idea of what my children look like. And I've got friends now where I've got no idea what they look like. And I certainly don't know how I've aged. The 'bionic eye' as a treatment for retinitis pigmentosa has been tested in Oxford since 2012 and during this time the University and hospital have worked in close partnership with Retina Implant AG to develop the technology with the hope that it will one day be ready for use across the NHS. Initially six patients were implanted for up to a year with the first generation device in order to see if it worked. Although the first chip was not designed for permanent use, lasting up to a year , the positive results from the initial study led to further developments of the chip in order to make it robust enough to last for an estimated four to six years. Other developments include changes to the voltage currents so the chip uses less power to enable it to last longer, improvements to the chip electrodes to give it a better resolution and increased protection against the saline environment inside the human body. The chip only has 1,600 pixels (the previous chip had 1,500 pixels) but the image is refreshed regularly as the eye moves. Although this is less than 1% of one megapixel, which is not much compared to a standard phone camera, the chip has the advantage of being connected to the human brain, which has over 100 billion neurons of processing power. Rhian is the first patient outside Germany to be implanted with this second generation device. Using dials on a small wireless power supply held in the hand, she can adjust the sensitivity, contrast and frequency to obtain the best possible signal for different conditions. A total of six patients will be taking part in the latest trial at the John Radcliffe Hospital. Professor Robert MacLaren, who is leading the trial, said: 'Restoring sight to the blind using an electronic device presents huge challenges for the technology, the surgery and above all, the patient. But at the same time, we know the huge potential benefit if we can get it right. I am delighted that the trial has started so successfully with the excellent results we have had so far with Rhian. 'For a blind person having independence is a very important aspect of their vision so if we can give someone enough vision so that they can see where they are in the home, they can go out, they can walk to the bus stop, they can go out and they can see people around them, they're basically aware of their surroundings then we've achieved a great deal. The study was led by the University of Oxford’s Nuffield Laboratory of Ophthalmology in collaboration with Oxford University Hospitals NHS Foundation Trust and Retina Implant AG. Rhian’s story will be told in full in Wednesday’s (6 Jan) episode of Trust Me, I’m a Doctor on BBC2 at 8pm.